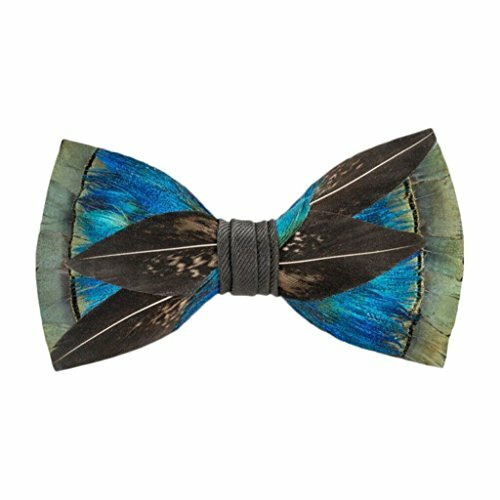 Brackish bow ties are a work of art that are completely unique and individual. Brackish repurposes the beauty of nature by recycling feathers into one of a kind bow ties. The intricate production process, in which the feathers are individually hand selected, cleaned, paired, and crafted, requires 4-5 hours to complete for each bow tie. Brackish bow ties are handmade by a team of artisans in Charleston, South Carolina. Brackish sustainably sources feathers from all over the United States. When birds molt, they lose their feathers, which are usually thrown out. No birds were harmed for their feathers. Each bow tie is pre-tied and presented in a deluxe wooden box ready for gifting. Packaged with care instructions in closed top wooden storage box wrapped in burlap. Bow tie is wrap around adjustable hook on style up to 20"
View More In Bow Ties & Cummerbunds. If you have any questions about this product by Brackish, contact us by completing and submitting the form below. If you are looking for a specif part number, please include it with your message.